Daily Illuminator: Edible Ogres . . .
October 26, 2005: Edible Ogres . 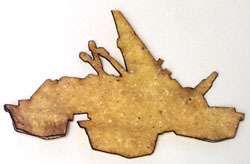 . .
We received a batch of tortilla chips with our most recent Ogre Ornaments order. They were mysteeeeeriously cute, so we asked Richard Kerr, the creator . . .
"It's something I've been meaning to try out, a silly idea, mostly. Next will be the 'mysterious image on a piece of toast' trick. That batch isn't edible because the chips are old, but another tortilla I sampled turned out to have a very nasty 'charred' taste to it, so we can't do real edible food with it." Genius or madman? I do not know - but here at the office we've been daring each other to eat laser-etched chips all day.